Sydney’s #1 anime convention returns! 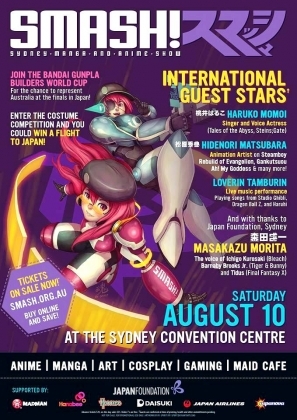 It is that time of the year again where one of Australia’s most celebrated Japanese pop-culture conventions, SMASH! Sydney Manga and Anime Show, is ready to dominate Sydney’s pop-culture scene on August 10, 2013. Now in its seventh year, organisers are expecting more than 6,500 attendees to come through the doors at this year’s convention. Amongst the crowd will be talented cosplayers, thousands of enthusiastic manga and anime fans, aspiring artists, gamers, top-class special guests from abroad and many more. With the largest vendor hall seen in years and plenty of attractions to see and participate, SMASH! convention-goers will be able to roam around and immerse themselves in an authentic Japanese pop-culture environment. This includes viewing featured artists and vendors; showing off their artistic talents via competitions and cosplay (fan-made costumes); participating in unique workshops; buying exclusive merchandise; and becoming acquainted with the maids and butlers at the SMASH! Japanese-inspired Maid Café. Foundation, Sydney, voice actor Masakazu Morita, who is best known for his roles as Ichigo Kurosaki (Bleach) and Barnaby J. Brooks (Tiger and Bunny). “Believe it or not, our followers have incredibly high expectations of SMASH! bringing well-known Japanese talent to the convention every year,” SMASH! President Ray Elinon said. But that’s not all! For the first time ever, SMASH! will be having Japanese musical acts performing during and after the SMASH! convention. Coming all the way from Japan, indie J-pop band LOVERIN TAMBURIN will be performing live on stage, entertaining crowds with their original songs and covers from popular anime such as Dragon Ball Z, Haruhi Suzumiya and Studio Ghibli films. This year, the fun for SMASH! will extend through the night even after the convention’s curtain call. Dubbed as ‘Vocaloid Night 2013’, SMASH! will be hosting an after-convention party, featuring world famous Vocaloid DJ guests Hachioji P and kz(livetune) to celebrate a night of Vocaloid music. various Japanese pop-culture elements very well,” Elinon said. SMASH! will be at the Sydney Convention and Exhibition Centre (Darling Harbour) on Saturday, August 10. Advance tickets are currently on sale until July 31st for $29, and door tickets may also be purchased on the day for $35. For more information, visit www.smash.org.au.